There are quite a few car clubs in the Hill Country. These automotive enthusiasts love getting together to show off their prized possessions as well as the camaraderie and opportunity to talk about cars. Most of the clubs will have one or more events per year where they gather at a high school or church parking lot. Not much to do at these meets but show off their cars. The annual car show in Marble Falls, however, is special. It is one of the few car shows that takes over a downtown area and offers participants the opportunity for more interaction with the public. As well as shopping and dining. In the past, the Main Street Marble Falls Car Show was organized by the Lion's Club as one of their big yearly fundraisers. Due to reduced membership, the Lion's Club approached the Kiwanis Club and asked us to take on this fundraising opportunity. Lion's Club member Bill Lehr, and Kiwanis Club member Jack Sargent, a car enthusiast himself, worked together along with a large contingent of Kiwanis Club members to make this one of the best car shows in recent years. There were 87 entries, mostly from the Hill Country area, but one from as far away as Odessa. Antique cars, new cars, sports cars, pick-ups, hot rods, you name it - there was a huge variety. The overall "Best of Show" was the 1970 Plymouth 'Cuda owned by Lorenzo Romero from Burnet. Scroll down to view photos of the cars and down town Marble Falls. 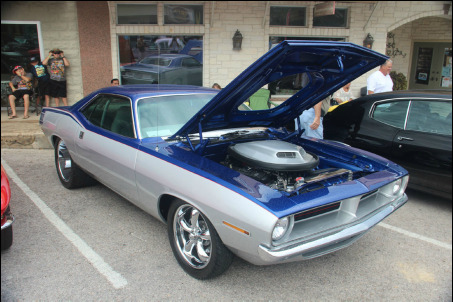 ​This 1970 Plymouth 'Cuda was chosen as the "Best in Show" at the Main Street Marble Falls Car Show. 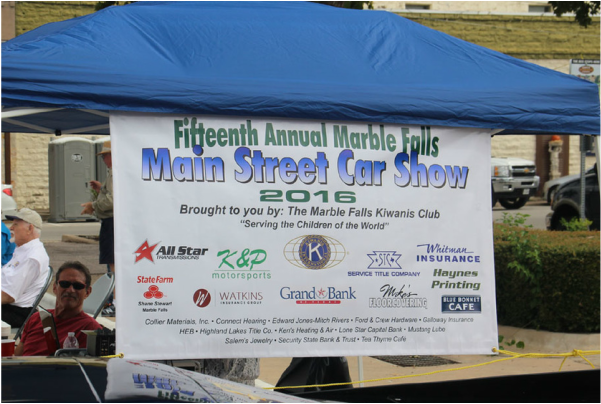 The Marble Falls Kiwanis Club thanks our major sponsors and sponsors for their support of the car show. (See sponsor names below.) This is one of several fund raisers we organize each year. Proceeds are used to support Highland Lakes Boys and Girls Club, MFHS Athletics, MFHS choir, MF Youth Baseball and Softball Association, Granite Country Youth Soccer Association, and college scholarships for graduating high school seniors. These photos illustrate that, indeed, this was a Main Street event. The owners of the twenty cars named by the judges as the Top Twenty cars in the show are listed below. Here are photos of the Kiwanis volunteers who made the car show possible. Thanks to all.